Hanko is a bilingual port town and municipality on the south coast of Finland, 130km west of Helsinki. Kick off your visit on the 23rd (Sun): tour the pleasant surroundings at Bellevue Beach, look for all kinds of wild species at Tulliniemi Nature Path, and then take in panoramic vistas at Hanko Water Tower. For reviews, maps, and other tourist information, read our Hanko itinerary tool . Edinburgh, UK to Hanko is an approximately 8-hour flight. You can also drive. Due to the time zone difference, you'll lose 2 hours traveling from Edinburgh to Hanko. June in Hanko sees daily highs of 20°C and lows of 9°C at night. Finish up your sightseeing early on the 23rd (Sun) so you can go by car to Turku. Start off your visit on the 24th (Mon): pause for some serene contemplation at Archangel Michael's church, then take in nature's colorful creations at Turku University Botanical Garden, and then trek along The Archipelago Trail. Keep things going the next day: let the kids burn off some steam at Adventure Park, explore the world behind art at Ett Hem Museum, examine the collection at Sibeliusmuseum, then stroll through Kupittaa Park, and finally take an in-depth tour of Pharmacy Museum and Qwensel House. To find reviews, more things to do, maps, and more tourist information, you can read our Turku holiday site . You can drive from Hanko to Turku in 2 hours. June in Turku sees daily highs of 20°C and lows of 9°C at night. 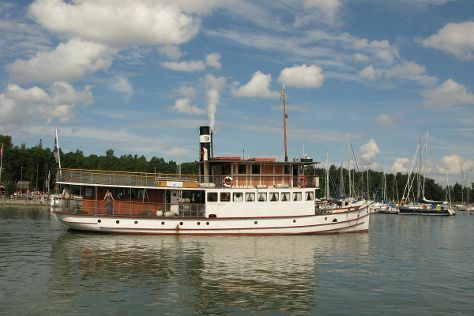 Finish your sightseeing early on the 25th (Tue) to allow enough time to travel to Mariehamn. Mariehamn is the capital of Åland, an autonomous territory under Finnish sovereignty. Kick off your visit on the 26th (Wed): steep yourself in history at Jan Karlsgården Outdoor museum Jan Karlsgården, then stroll through Kobba Klintar, then brush up on your military savvy at Aland Maritime Museum, and finally test your team's savvy at popular escape rooms. To see ratings, more things to do, reviews, and other tourist information, read Mariehamn vacation planner. Getting from Turku to Mariehamn by flight takes about 2 hours. Other options: ride a ferry. In June, daytime highs in Mariehamn are 19°C, while nighttime lows are 10°C. Finish your sightseeing early on the 26th (Wed) to allow enough time to travel to Tampere. On the 27th (Thu), enjoy the sand and surf at Rauhaniemi Beach, then take in the architecture and atmosphere at Finlayson Church, then see the interesting displays at Sara Hilden Art Museum, and finally steep yourself in history at Amuri Museum of Workers' Housing. To see ratings, more things to do, where to stay, and other tourist information, go to the Tampere trip itinerary builder tool . Traveling by combination of flight and train from Mariehamn to Tampere takes 4 hours. Alternatively, you can do a combination of flight and bus; or fly. In June, daytime highs in Tampere are 20°C, while nighttime lows are 9°C. Finish up your sightseeing early on the 27th (Thu) so you can catch the train to Jyvaskyla. Jyväskylä is a city and municipality in Finland and in the western part of the Finnish Lakeland. Kick off your visit on the 28th (Fri): test your team's savvy at popular escape rooms, see the interesting displays at The Craft Museum of Finland, then stroll through Tourujoen luontopolku, then learn more about the world around you at Natural History Museum of Central Finland, and finally learn about all things military at Finnish Air Force Museum. To see photos, more things to do, reviews, and tourist information, use the Jyvaskyla tour planner. You can take a train from Tampere to Jyvaskyla in 2 hours. Alternatively, you can drive. In June, daytime highs in Jyvaskyla are 21°C, while nighttime lows are 8°C. Cap off your sightseeing on the 28th (Fri) early enough to go by car to Kotka. Kotka is a city and municipality of Finland.Kotka is located on the coast of the Gulf of Finland at the mouth of Kymi River and it is part of the Kymenlaakso region in southern Finland. Start off your visit on the 29th (Sat): hike along Santalahti Nature Trail, let little ones run wild at Katariina Seaside Park, then pause for some photo ops at Kotka Sculpture Promenade, and finally take in nature's colorful creations at Sibelius Park. Get ready for a full day of sightseeing on the next day: take in the spiritual surroundings of Kotka Church, then identify plant and animal life at Riverside Park, then admire the landmark architecture of Hamina Town Hall, and finally delve into the lush surroundings at Niivermaki Nature Conservation Area. To find where to stay, more things to do, and more tourist information, read Kotka trip itinerary website . You can drive from Jyvaskyla to Kotka in 3.5 hours. Alternatively, you can take a train; or do a combination of bus and train. In June, plan for daily highs up to 22°C, and evening lows to 11°C. Wrap up your sightseeing on the 30th (Sun) to allow time to travel back home.